Although you might not think it, there are plenty of different ways to make a wedding bow. Some of these methods work better for decorating some wedding areas than others. In our series on wedding bows so far, we have covered chair back bows, pew bows, and big poofy bows. Here we look at making large bows for every other wedding surface, as well as more specific advice on how to make tulle wedding arch bows. You can always mix and match methods to suit you though - some instructions may get your fingers in a twist, while others will leave you feeling more superior than Martha Stewart. 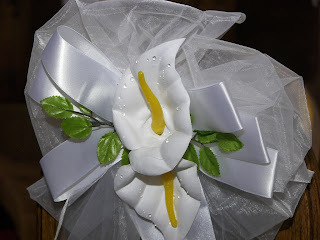 Making large wedding bows begins with a long length of ribbon of fabric (3 yards or more), to create big loops to decorate any area of your wedding venue. If you can get your hands on some wired ribbon, then the loops will stay in place better, but if you want a softer look, then using organza or tulle fabric for your bows is the way to go. 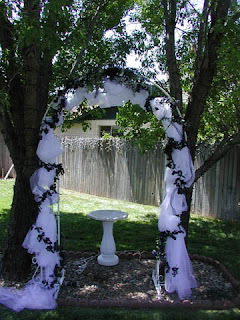 To create a large wedding bow like the loopy circular one pictured, you need to use the easy figure of eight looping technique. If you find this tricky, more tips can be found in our article on how to make big poofy wedding bows. Hold your length of fabric in the middle, and make a loop on one side, then repeat on the other side. Continue this process using one hand to make the loops, and the other to hold them securely in the middle, working your way around in a circular motion. When you are finished, hold the loose ends at the back of the ribbon, and wrap another length of fabric around this - this helps to both secure the ribbon, and to add an attractive sash effect to the bow. 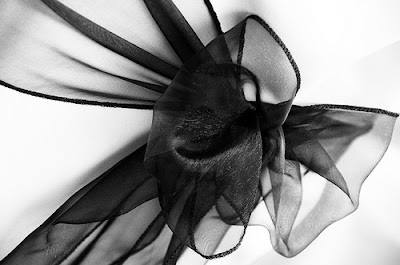 There are two options when learning how to make tulle wedding arch bows. One is by following the looping figure of eight method above, and the other is to make a large and dramatic wedding arch bow that is a simple bow, but that will add flow, and soften the edges of the arch. If you can find wide enough tulle ribbon that is wired, then your job will be so much easier, but as we are looking at decorating an arch, we really need to use ribbon or fabric that is quite wide, so this may not be possible. Often, the same tulle fabric used to decorate the wedding arch, will be used for the wedding bows. It obviously depends on the look you are after, but the width of tulle you are looking at using should be a minimum of 6 inches wide and 2-3 yards long - tulle is a very sheer fabric, and when used on large items especially, it can be "lost" if not used in large quantities. While the method in making a large tulle wedding arch bow is simple, it's often getting it to stay in place that is the real test. There are two unlikely tricks to help you get around this though. You will need clear elastic bands (or bands the same color as the fabric), and a can of spray starch. Wrap the length of tulle around the wedding arch, and tie in a half knot. Make bunny ear loops using the ends, and leave some fabric hanging down from each side. Hold the loops together, and wrap the rubber band around the bottom - this will keep it more secure than tying the bows together which is an especially useful tip for outdoor weddings. With the last step in how to make tulle wedding arch bows, you may want to add to the visual appeal by making the bow more rigid, rather than hanging loose. With a can of spray starch in one hand, fan out the bow with the other hand and spray into position - of course the exact position won't hold in this form, but it will help to firm the bow up into staying proud on the wedding arch. With how to make large wedding bows covered, decorating a wedding venue will be a breeze. When making tulle wedding arch bows, why not try adding to them, by sliding in some flowers or strings of fake gems into the bow that coordinate with your wedding theme.